I first met Sylvie Gouin, the authour of this book, when I began taking classes at her yoga studio in Ottawa a couple of years ago. I loved everything about the classes (even the parts – or maybe especially the parts – that I couldn’t quite do!) The asana practice was always challenging and invigorating. But what I really loved was how Sylvie brought the yoga philosophy and teachings into all of her classes. She always managed to share her knowledge with passion, honesty and humor and it never felt preachy. So when Sylvie told me that she was writing a book, I was very excited. 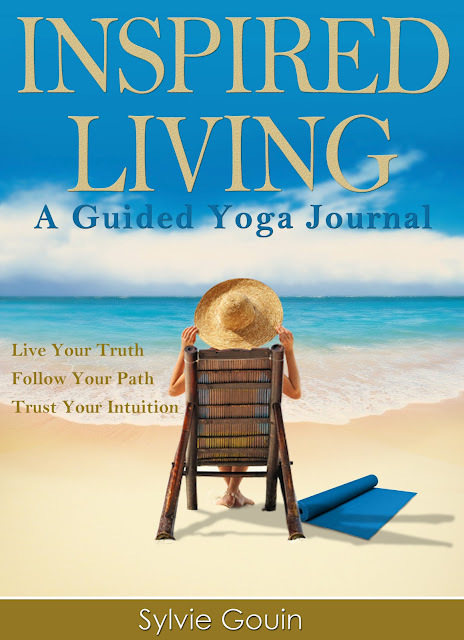 Sylvie’s book, Inspired Living, is a guided yoga journal that is meant to help you reflect on yogic ideas and find a bit of clarity along the way. I love eBooks and always have my kindle loaded with a variety of different reads to suit my mood. When Sylvie emailed the book to me, I was at work and didn’t have my kindle with me. But I was very anxious to read it. So I printed the first 25 pages or so. I work at Carleton University in Ottawa, where we have a beautiful campus right on the river. So I took my freshly printed pages, found a beautiful spot under a tree and dove in. I felt like I was back in Sylvie’s class, having a conversation with her. The book was a joy to read and I could hear her voice as I went through the pages. Sylvie recommends that you read through the entire book once before starting to journal. So over the next week or so, I continued with my little ritual. Printed a few more pages each day, and took them to my tree down by the water. I really began to look forward to this inspiring little part of my day. Inspired Living is set out in a series of yoga related topics. Sylvie goes in depth explaining a particular topic and how it is approached from a yogic perspective. In each section, she refers to the concept and how it is described in the yoga sutras, introduces relevant Sanskrit terms and shares a personal story. Topics covered include things like: equanimity, the Gunas, gratitude, mind/body and the four aims of life. At the end of each section, Sylvie gives you questions to think about and use to jump start you journal writing. I loved this book and plan to continue my newfound lunch hour tradition – re-reading Inspired Living. This time with pen and paper in hand ready to journal! I highly recommend you pick up a copy of Inspired Living. You can findd out more about it at Sylvie’s blog. And of you live in the Ottawa area, Sylvie will also be offering inspired living courses.